- Hear the 'old rumor' that there are no fish in the Kasilof in July?? We hear it all the time! We kind of like it that way! That keeps the river nice & quiet! 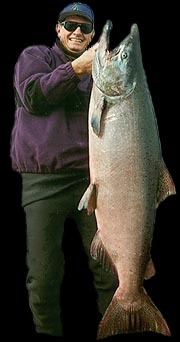 - Visit the Gallery Pages for loads of photos of Kasilof River July King Salmon Action! And feel free to contact us for references of July fishing action! 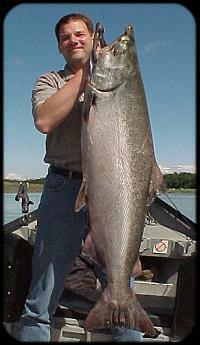 - Visit our Packages Page to see available packages that include fishing on the Kasilof! For many years this was perhaps the best-kept secret of all of the Kenai Peninsula fisheries. The second run of kings entering the Kasilof provides Kenai Peninsula anglers with catches of trophy-class Alaska king salmon without the crowds of the nearby Kenai. There are roughly a dozen guides that fish the river on a daily basis through the month of July, compared a few hundred on the Kenai. Bob himself is one of these Kasilof-only guides that provide their clients with an intimate knowledge of the river and its fish that only a few guides possess. In fact, Bob and our second guide are the two most experienced Kasilof-only guides currently working the river. 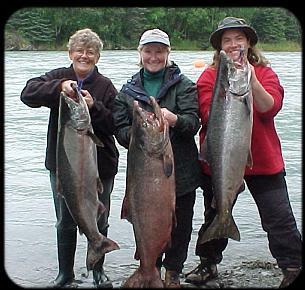 Piscatorial Pursuits' Guests lay claim to 1st and 2nd Place in the 2008 Kasilof River King Salmon Derby! While the next world-record will not come from its glacial waters, our clients catch 50 to 60 pound class fish nearly every week during the second run of kings. The second-run kings are native to the river, with the majority of the fish spawning near the outlet of Lake Tustumena at the river's headwaters, and a lesser percentage spawns throughout the remainder of the river, with some fish spawning as low in the river as just above the river's mouth. Larger than their June counterparts, these fish usually average close to thirty pounds with regular catches of trophy class (50 pounds or better) kings. First rule of Alaska Fishing fellas ... the gals always win! 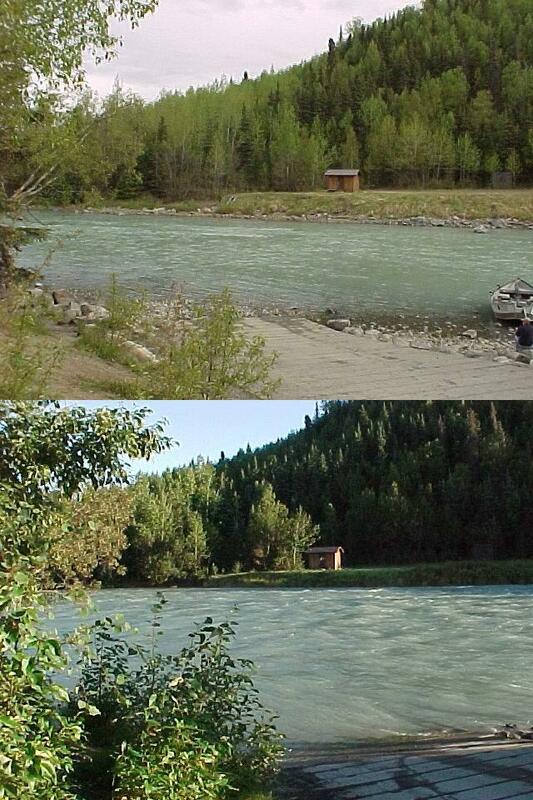 The river in July looks very different than it does in the May / June fishery. The long, warm(er) summer nights cause the glacier feeding the lake to melt heavily, raising the river's level by four feet or more from the early season levels. For a view of the difference, click here. This increased flow, coupled with ocean-fresh, large kings provides some of the most spectacular king salmon battles you'll find anywhere! It is not uncommon to watch kings peel off 100-150 yards of line in a matter of seconds ... watch those thumbs, and hold on! Our July fishing style changes a little with the changes in water flow ... we still backtroll jet diver / spin 'n glo / egg combos in a few areas, but we spend more time anchored in the traveling paths of tidewater, looking for groups of fish ascending the river with each high tide. One of the many certified ADF&G trophies caught aboard our boats!